B) chomping at the bit for more of the same at the next sesh. A final 5-10 minute finisher workout is a great way of doing just that. 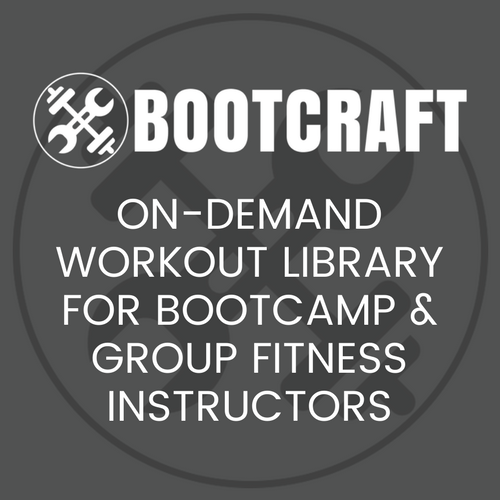 Just to go back to point A) briefly: I know a lot of instructors like to spring finishers on bootcampers purely as a way of brutalising them in those final few minutes. I suppose their aim is to leave them a little reminder the following day, when clients are forced to approach stairway descents backwards or swagger around like they’ve ridden a rodeo bull. But be careful you’re not engraving a wholly uncomfortable memory of bootcamp. You also want campers to feel buzzing at the end of the session – smiling and motivated for more. I’ve dug up four finishers that I think are a good mixture of pleasure AND pain. A finisher that gets campers working as a team, with the winners being the ones that complete the challenge first. First split bootcampers into teams of 4-5 people and ask them to form a circle facing each other. Part A of the challenge is to complete 100 reps of an exercise whilst done as a team by working around the circle one person at a time shouting the reps as they go. Use plyometric exercises to guarantee that finishing burn (sergeant jumps, tuck jumps, jumping get-ups, burpees and power push-ups all work well). After a quick breather give them another round, changing the first exercise and giving a new mystery exercise. An oldie, but a goodie, Every Minute On the Minute workouts (usually shortened to ‘EMOMs’) are a fantastic way of getting clients working hard continuously for those final few minutes. And this 8-minute partner version is a real b*tch. First mark out your suicide shuttle using cones. For those of you who don’t know, a suicide shuttle is an incremental distance run where each shuttle gets longer – essentially five/six cones are placed in a line five large paces apart, you run out to the first cone and back, out to the second cone and back and so on until all cones have been visited. One partner has 60 seconds to run a suicide shuttle then smash out as many burpees as they can in the remainder of that minute. Whilst the above happens the other partner either rests (for beginners), holds a plank until their partner has finished the suicide run (for intermediates) or planks all the way through the 60 seconds (for advanced). Partners then trade places and continue. Here’s the recipe: You take one chest to the ground burpee, dissect it, then add a healthy splodge of time. Hey presto you get a spicy little finisher that will have your clients groaning with pleasure/pain. Keep repeating rounds removing two more seconds off each, but maintaining a 15 second rest between rounds. I scavenged this beauty of a workout from the local powerhouse and bootcamp guru Matt Shore from Train Strong. It’s dead-simple way of transforming the beast that is the tug of war into even more of a monster. Set up the tug of war as you would normally – so basically split the group into two even teams, position them on the rope and place marker cones in line with the midpoint of the rope. Now also place an outside marker cone 30-40 paces away from each end of the rope – the reason why will become apparent in a sec. On the shout GO both teams pull until one has been dragged across the midpoint. At this point both teams drop the rope, turn and sprint to the outside marker cones and back, then pick up the rope ready to immediately start to pull again on your command (to keep people together get the slower amongst the group to turn round as soon as the see the fastest get to the cone and turn). Repeat the above process for three to five rounds, with no/little rest. To keep things even, for each round reposition the rope so the centre is by the midpoint before the teams return from their sprint. Great tactics of workouts. This would at least be get on the campers and learn from this.